TV shows always ask the actors on what would they take with them if they would be stranded on an island. Pretending I’m an artist myself with conviction, I dare say maroon me in an island with Wifi and nuts. Both are essential for survival even if I break out eating almonds. Who’s there to judge me. On a more realistic setting, what would you take when you move in to a new place? Here are my essential list for a furnished room. Built-in closet is a must-have feature because I hate buying bulky closet. Study table with an office chair bedside table with a lamp. I used a vintage-theme box for storage and as a bedside table. Because, again, I hate heavy furniture. Bookshelf for my selected used books I have yet to read. Bed on which to rest my aching back and binge watch. Out of the list, I had the hard time deciding whether I should buy an air bed or a typical mattress. I knew I wanted to try an air bed because I haven’t use it before and it’s not heavy. It’s one of my adulting decisions that I’ve done right. Simple things make a lot of difference for my future and my back. Not the past. As in the spine. I made it clear how much I love my air bed but should you buy an air bed, air mattress, inflatable bed, or whatever it is called in wherever part of the world you are right now? Before I tell you the benefits of an air bed, I wouldn’t miss revealing why I chose it and ditched the whole bed ensemble, the kind of bed I used for my entire sleeping lifetime. The air bed is as light as a party balloon. I love and hate to move in a new place. It’s fun but could be a nightmare the moment I start thinking how to move a bed, bed spring, frame, and mattress. No. A monstrous bed will not stop me from moving to a new place because change in environment is good. By choosing an air bed, I was spared from packing misery. So onto the benefits for more convincing insights. I learned about these advantages by using the air bed for half a year. #1: Convenience. It’s given already. I can take it with me wherever I go. I will send one in a balikbayan box so I can use it on my vacation in the Philippines. Our house has rooms but limited beds so I’ll bring my own bed which can also be used by a guest. Who wants to kneel and reach under a bed in the name of cleanliness? When it’s time to clean my room, I can lift the air mattress with one hand. This is a perfect picture of power. Imagine a domesticated Clark Kent when his not busy saving the world. #2: Durability. Air bed is made of odorless PVC. It can hold heavy load for a long time. I’m not sure how long my bed will last but with the tender loving care I give to it, I’m guessing I’ll sleep on it for two years. #3: Comfort. I thought an air bed would hurt my back. Well it did because it was too firm during the first week. As the days passed by, the bed became less firm and it’s even better than my usual queen bed. The trick is to find the level of firmness for your body. You’ll know by trying; don’t be quick in dismissing that an air bed is a bad choice. Give it some time. #4: Affordability. An air bed is cheaper than buying a bed with all that comes with it. With an air bed, you are paying for everything and convenience. Plug it in and you can rest your aching back. For less than $100.00 you can get all the benefits of sleeping on an air bed. 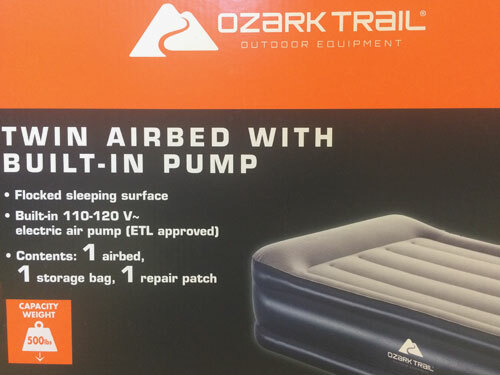 I’m using Ozark Trail twin airbed (with built-n pump) which I bought at Walmart so my findings on the benefits and tips were mostly based on my experience of sleeping on Ozark Trail bed. An air bed comes with flaws but I’ll show you how to get around it. Carpeted floor prevents the bed from moving/sliding. For tiles, line the floor with grip liner. Firmness of the bed is your comfort. Be kind to your back and listen how your body respond to the level of firmness. Fleece sheet can warm your body if you are like me who can’t tolerate the cold. Use a bed sheet on top of the fleece for a tidier and realistic look. An air bed, similar to other furniture, needs a tender loving care. Don’t jump on it as if it’s a trampoline. It’s not. Take your child at heart to the park or a real trampoline for fun. The middle of the bed is the best and secure spot to lay down. Don’t veer in the sides of the bed to be safe. Any sharp object should stay far away from an air bed. Balloons are fun to burst but not the precious air mattress. You get the idea why. The main point is to treat your air bed just as you would (or even more) a conventional bed to make it last. The goal is to take advantage of the benefits of sleeping on an air bed without costing you much. Something is out there for you. 1. Stick to your budget. I thought I would have to spend a hundred to have a decent bed to rest on but I was glad to be wrong. For $60.00 ish I bought the right bed. I could save more if I waited for it to be on sale. But don’t buy cheap air bed because you do get what you pay for. Ironically, the opposite doesn’t always mean the best. 2. Read reviews. It helps to read online reviews although some are discouraging and confusing. Why this person love it so much yet the other regret the purchase. Take reviews with a grain of salt while considering the budget. 3. Choose an air bed with the right size for you and the room. And I mean the width and height. I chose a twin size bed to have more space in the room so I can do stretching on a yoga mat. Who loves Warrior pose? And why would I need a King or Queen size bed if I tend to sleep in one spot. I like a bed with at least eight inches in height. I don’t like the feeling of almost sleeping on the floor with the bed in between. For some it works well. It’s a no no for me. 4. To have or not. An air bed with a built-in pump is my first criteria in looking for the almost perfect affordable bed. I don’t like to spend for a separate air pump and figure out where I place it whenever I have to inflate the bed. 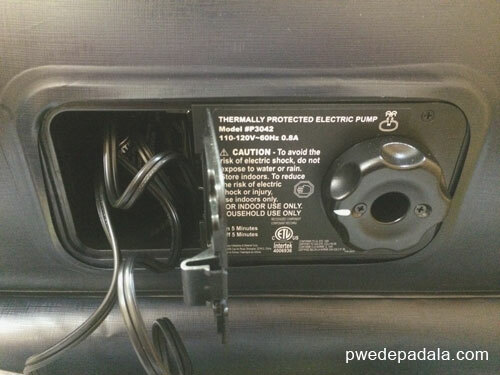 Affordability, convenience, and space are synonymous to a built-in air pump. But what if the built-in air pump doesn’t work anymore? Yep! That’s one thing to consider and I don’t want to deal with it before my bed kick the bucket. Those are the few tips I have for you in buying the right air bed. Unlike a bed in IKEA that you can feel and lay on, your future air bed is sleeping inside it’s box waiting to be inflated. So before you go and willy nilly grab an air bed in a store, remember my tips on how to buy the right air bed. I took a chance in buying an air bed because I don’t want to spend a lot for a bed that I have to drag every time I move to a new place. To my surprise, I get all the benefits with little drawbacks by taking chances. You have to try sleeping on an air bed. Let your body feel the firmness. It’s the only way to find out if you should keep using an air bed or not. If it works, you found a diamond in the sky. If not, you wouldn’t break your back getting rid of it. It could be a guest bed for a night or two. Update: I bought a minimalist bed at IKEA. Will you give up your bed for an air bed? Why or why not?